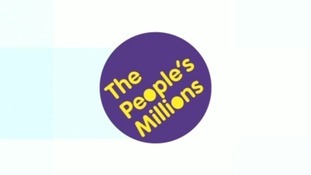 The deadline to enter The People's Millions competition is approaching. Over the previous nine years, ITV has teamed up with The Big Lottery Fund, which distributes grants from the money raised by the National Lottery for good causes. During that time, more than £30 million has been awarded to hundreds of communities projects across the UK. This year, there are four awards of up to £50 thousand each to give away in our region. We are looking for applications from a whole range of organisations or community-based projects that will improve the lives of people in the local community. You could be a Voluntary or Community Organisation, a School, a Local Authority, a Health Body, a branch of an Organisation or a Partnership. You can enter any time between now and noon on May 16th by visiting The People's Millions website or calling 0845 0 10 11 12. Each call to the application line costs up to a maximum of 3p per minute plus an additional 14p set up fee from a BT residential landline. Calls from other networks may be higher and from mobiles will be considerably more. Entrants must be 18 or over. Lines close on Friday 16th May 2014 at midday. Calls made after the closing time will not be counted but may still be charged. The People's Millions competition has returned. What does it take to become a People's Millions project? The People's Millions is launching next month. It has four grants of up to £50,000 to award to projects that improve the lives of local people in the Tyne Tees region, so now is the time to start thinking if you have an idea you believe could be a contender. But what projects are we looking for? What are the keys to success?. David Wood has been investigating and speaking to Brainy Dogs project - a winner in 2011. On tonight's programme (Thursday, November 28) ITV News Tyne Tees revealed the winner of Wednesday's People's Millions competition. Saltburn Theatre Magical Transformation was presented with a cheque for £50,000 from The Big Lottery Fund to refurbish and update the town's community theatre. A bonus grant for the best People's Millions runner-up project goes to RVS Men in the Workshop. They will get almost £50,000 to create a workshop in a disused garage in Wooler in Northumberland, where older men will be able to get together and improve their wood-working and craft skills. On tonight's programme (Wednesday, November 27), ITV News Tyne Tees revealed the winner of Tuesday's People's Millions competition. U Can Achieve IT, in Pelton Fell, was presented with a cheque for £42,743 from The Big Lottery Fund to update computer equipment and pay for tutors. Over the past eight years, ITV - in partnership with the Big Lottery Fund - has awarded nearly thirty million pounds to more than five hundred community projects across the UK. Prizes of up to fifty thousand pounds each will be awarded to the winning projects. We want to encourage applications from a wide range of organisations that can submit community-based projects which improve the lives of local people. Branches of Organisations or Partnerships. You can enter any time between now and noon on May the13th. Visit www.itv.com/peoplesmillions OR call 0845 0 10 11 12. Each call to the application line costs up to a maximum of 3p per minute PLUS an additional 14p set-up fee from a BT residential landline. Lines close on Monday 13th May 2013 at midday. If you want to be part of the Peoples Millions here's how you can receive an entry pack. Visit www.itv.com/peoplesmillions Or call 0845 0 10 11 12. Each call to the application line costs up to a maximum of 3p per minute plus an additional 14p set up fee from a BT residential landline. Calls from other networks may be higher and from mobiles will be considerably more. Entrants must be 18 or over. Lines close on Monday 13th May 2013 at midday. Calls made after the closing time will not be counted but may still be charged. The People's Millions is back to ITV regional news. Across the country we are giving away 76 prizes of up to £50,000 each to the winning projects - and of course there will be big prizes in the Calendar region too. Over the past eight years ITV in partnership with the Big Lottery Fund has awarded nearly 28 million pounds to 523 community projects across the UK. Sally Simpson has been to York to catch up with one of our previous winners to find out how the grants have helped improve lives. But be quick - the closing date is next month.